The breakfast buffet was delicious! The hotel is very centrally located, great access to the city. Rooms were larger than expected. Great location with a very comfortable room. The food was good and very nice and helpful staff. We love the Atlas Post Hotel. Its location is perfect. Great location on Marienplatz next to a pedestrian zone of shops and restaurants. Beautiful hotel, great staff, central location. Everyone is very nice and accommodating. All the amenities are right there, the train station is 15 min walk. The breakfast is 11 euros but is very good, buffet style. The hotel has a long history of service and customer care, and the bus routes are running very close to the hotel which can take you easily to the Olympic stadium and Bahnhof - really convenient. It was cozy and comfortable. The jacuzzi tub was wonderful. Huge bathroom. Great location! Personable staff. Nice space in the rooms. Quaint decor. Comfy beds. Kind and helping staff. Great room facilities. Enjoyable stay! The property was gorgeous. I really appreciated the historical aspect of this location. The breakfast was delicious and well worth the price, the beds were comfortable, the restaurant was delicious and the food was definitely priced fairly. The staff was very helpful and friendly. Atlas Posthotel This rating is a reflection of how the property compares to the industry standard when it comes to price, facilities and services available. It's based on a self-evaluation by the property. Use this rating to help choose your stay! 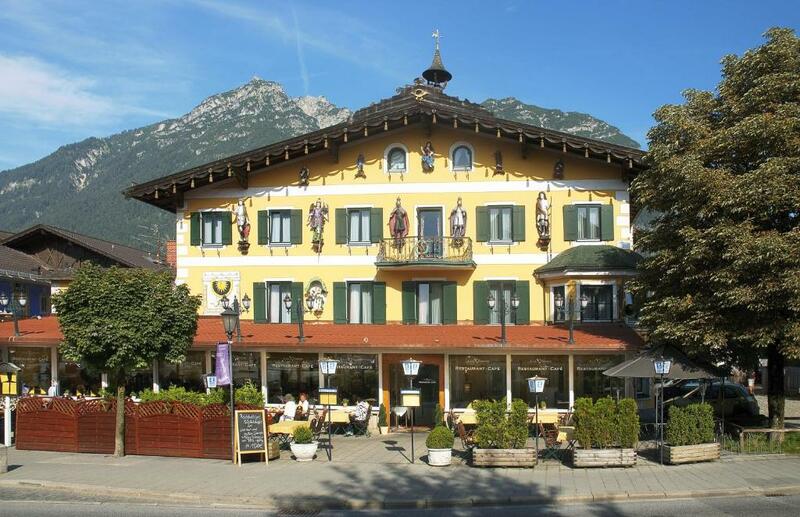 One of our top picks in Garmisch-Partenkirchen.This traditional hotel offers elegant rooms and apartments, free Wi-Fi internet and free use of the sauna. 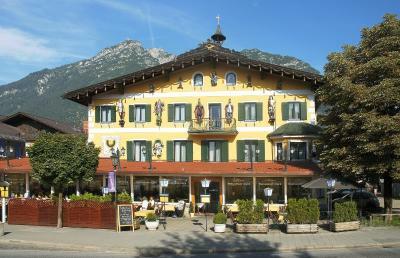 It lies in the heart of Garmisch-Partenkirchen, a 10-minute walk from the train station. Dating from 1512, the Atlas Posthotel provides rooms with cable TV. There is a free bottle of mineral water in each room. The modern apartments are located in a building nearby and can accommodate up to 4 people. They have a flat-screen TV and a kitchenette. Free WiFi internet is available in all areas of the Posthotel. Public parking spaces are available nearby and for a surcharge. A rich breakfast buffet is provided each morning. The Poststube restaurant serves a range of Bavarian dishes and local beers. There is now a new steakhouse at the hotel serving various steak dishes and high-grade wines. Guests are welcome to relax in the Postbar and lounge. The terrace is open during the summer. This is our guests' favorite part of Garmisch-Partenkirchen, according to independent reviews. When would you like to stay at Atlas Posthotel? Warmly decorated room offers a private bathroom and cable TV. Warmly decorated room includes a private bathroom and cable TV. These modern apartments have a double bedroom, a large dining table, cozy armchairs and a flat-screen TV with 30 channels. Please note that the apartments are of differing sizes. Please note that the apartments are located in a separate building, 164 feet away from the hotel. Breakfast is served in the main building. There is no daily cleaning service included, but a cleaning can be requested at the reception for a surcharge. This very spacious double room has a comfortable living area, a cable TV and a private bathroom. This apartment has a microwave, seating area and dishwasher. In this apartment, there are no separate bedrooms. This apartment features a cable TV, microwave and dishwasher. This elegant suite has a sitting area with a panoramic window offering mountain views. House Rules Atlas Posthotel takes special requests – add in the next step! Debit card Atlas Posthotel accepts these cards and reserves the right to temporarily hold an amount prior to arrival. Atlas Posthotel accepts these cards and reserves the right to temporarily hold an amount prior to arrival. Please note that there is no access by elevator to the apartments. Please note that the apartments are located in a separate building, 150 feet away from the hotel. Breakfast is served in the main building. There is no daily cleaning service included, but a cleaning can be requested at the reception for a surcharge. Please note that certain categories do not have capacity for extra beds. Nice and clean very good location. Equipment in the annex room was minimal. Kitchen utensils, cutlery etc and tiny table for eating. No tea towels for drying dishes etc. Requested a room with a bath. Communication difficulties meant they thought we meant bathroom. So we ended up with a shower. Shower n our room leaked all over floor when trying to have shower. Told staff, they just put a towel to stop it. Staff ok - don’t seem too interested in their guests but didn’t bother us too much. Location was excellent. Close to ski buses and train station. Breakfast was ok. Usual ham cheese bacon tomatoes. Was ok. I asked for a quiet room but both nights I could hear the families in the room next to me. The second night was worse because it was like they were having a party in my room! Oh, well. I won't come back because of the noisiness. Not to mention there is no parking at the hotel and the nearest city parking is a couple 100 meters away. It costs 2.5 Euros a day and the hotel does not reimburse. Hotel was in a central location with plenty of restaurants, bakeries and stores nearby. Ski area very close by. Hotel staff was friendly. Hotel has an Italian restaurant with friendly and helpful staff. Our family Stayed in one room when we thought we had separate bedrooms. Management said photos depicting the apartment on their website were "Just samples" and there was no guarantee of a separate bedroom. We were told we could move to another apartment with an extra bedroom on 2 separate occasions bit it never happened. The room was dark, there weren't enough light bulbs and there was no view since the beds were facing the street and you had to keep the curtains closed. The coffee maker had no pot and the tea kettle was foul. Breakfast was bad with few options. A ton of money and simply not worth it. Great breakfast. Always nice to see a bit of eggs, bacon and fried toast on top of the usual Austrian buffet breakfast. Located right by the centre of town and only a minutes drive from the ski lifts. Lovely hotel and the apartment that we stayed in was comfortable and spacious. Location was great , nice atmos !